These workhorse fonts make light work of typographic layouts, bringing a touch of elegance and professionalism to every design. These are our top ten hard-working serifs and san-serifs which will look beautiful on any layout, along with suggestions for how to make the most of their classic good looks. Serifs might be more traditional than their sans sisters, but they don’t have to be formal or stuffy. These five serifs are designers’ top picks for typesetting paragraphs, crafting beautiful italics or setting gorgeous headers. While most of these have stood the test of time since their inception some centuries ago, we’ve also got a couple of more recent wildcards which we think will become modern classics. Designed by English typesetter William Caslon in 1722, Caslon belongs to the Old Style group of typefaces. Caslon soon became popular not only across Europe, but across the pond too. It became the defining typeface for books and administerial documents in colonial Amercia, and was even used to set the text for the Declaration of Independence. It may be Old Style, but Caslon still looks remarkably fresh and stylish when used on modern layouts. Use it to typeset books and magazines, or create pull out quotes in its italic weight. Use the italic ampersand to really add wow factor to invitations and menus. This magazine layout by Mark Brooks mixes Adobe Caslon Pro with a contemporary serif font, Neutra. Baskerville is a Transitional typeface, the successor of curvier Old Style typefaces like Caslon. Another English-designed typeface, it was created by John Baskerville in the 1750s. It has an overall sharper, taller design than Caslon, which makes it feel more serious. Baskerville is a font that means business, making it a great fit for more formal media, like novels, corporate stationery, and newspapers. Baskerville’s real strength shines through when used to set large sections of text. With generous leading and margins applied it really is unbeatable as a typesetting font. ’25 Layouts introducing Baskerville’ by Eman Ahel. Returning back to Old School serifs for a moment, Garamond is well-deserving of a place in our list. It really is the ideal romantic typeface, with a beautiful design that’s based on the organic curves of handwriting but with more structure and formality. There are now many incarnations of Garamond, but each take their cues from the typefaces created by the sixteenth century French printer Claude Garamond. The Garamond most designers know and love is Adobe Garamond, which was designed by Robert Slimbach in 1989. If you’re looking for elegance, grace, and beauty in a typeface, Garamond will undoubtedly fit the bill. It also happens to be one of the most eco-friendly typefaces to print as the characters require less ink than other similar serifs. Garamond looks as good set as body text as it does as a header, so don’t be afraid to use it generously. The first wildcard serif on our list is Calluna, a 2009 creation by Jos Buivenga. This font is chunky and assertive, with exaggerated serifs. The precise, clean lines of this serif make it a distinctly modern alternative to the curvy romance of Garamond and other old-style types. Calluna is a wonderful all-rounder for layout design. It does what every good designer sets out to do, combining the charm of classic design with the clean-cut appeal of modernism. Use it on anything that calls for a fine tuned balance of old and new. ‘Freedom Anthology’ by Tessera Marcin Hernas, using Calluna for body text. This second recent wildcard has become a firm favorite with designers since its release in 1996. Designed by Zuzana Licko, Mrs Eaves is named after the wife of John Baskerville, Sarah Eaves. A fitting tribute to Baskerville, Mrs Eaves nonetheless has carved out its own niche. For one thing, it’s more versatile as a display font compared to Baskerville. This is in part due to a lower x-height and incidents where characters are combined in unusual ways. Mrs Eaves is feminine and pretty, and has a more friendly feel than Baskerville which in some contexts can feel a little cold. Use Mrs Eaves for any text you want to draw particular attention to, and prompt the reader to slow down and concentrate—it’s a fantastic fit for poetry, quotes, posters, and books. Poster design, ‘Mrs Eaves presents Oscar Wilde,’ by Maximilian Mikorey. When you think of a ‘classic’ font, a serif might be the first thing that comes to mind. However, sans-serifs have almost as much history and heritage, with the earliest sans type styles being used in the Roman Republic. Sans-serifs really hit their stride in the early 20th century when they became the defining type style of the modernist design movement. Sans-serifs are instantly modernizing and simplifying designs that serve as the ultimate palette cleanser. Read on to discover the five sans-serifs most designers couldn’t do without. Gill Sans is one of the most widely used and deeply loved sans-serifs. Since its release in 1928 by prolific designer Eric Gill, it has come to define not only an era in British design (it was used across railway signage, posters, and timetables in England for many decades), but has gone on to be used across almost every media and in every country imaginable. Why is Gill Sans so enduringly popular? Perhaps because it’s refreshingly simple, but utterly distinctive at the same time. Pin-sharp angles combine with subtle curves to create a sans-serif that brings modern, approachable style to any layout. Brand designs for England’s Medieval Festival by Tanya Chursina. If you’re looking for a sans-serif with a little more crispness, Futura is a great choice. This geometric font is the more efficient, clean-cut successor of humanist sans-serifs like Gill Sans. Designed by Paul Renner and released in 1927, Futura’s simple design, made up of perfect circles, triangles, and squares, was a perfect match for the modernist Bauhaus movement in the 1930s. Despite Futura being nearly a century old, it’s now widely used across designs for its ability to look cutting-edge and forward-thinking. You’ll see it used across sci-fi movie posters, like 2013’s Gravity, as well as art gallery signage. It has an enduring directness, which gives an air of authority to print media. The posters for 2013’s Gravity use heavily tracked Futura. Image courtesy of Warner Bros. Although Avenir is inspired by geometric sans-serifs like Futura, it was actually designed in the 1980s. Its designer, Adrian Frutiger, named the font after the French word for ‘future,’ crediting Futura for inspiration. But Avenir is a little different, and feels even cleaner and simpler than Futura. Avenir has a more digitized appearance than earlier sans-serifs, and is probably one of the most versatile typefaces for clear and legible body text. Use it to give a sensible, unfussy look to brochures, apps or catalogs. IKEA app design by Jerry Chiang. Museo Sans may take its cues from midcentury sans-serifs but it’s a much more recent creation released by exljbris Font Foundry. Designed as a companion to Museo, a quirky and popular serif, Museo Sans actually has more versatility than its serif relation. An open, bouncy style gives this san-serif a similar warmth and approachability to Gill Sans, but its rounded curves really situate it in the here and now. We think it will be a modern classic for years to come. You can download commercial versions of the Regular and Italic weights for free here. Design for a mobile app proposal by Debra Bush. The final sans-serif on our list is another recent creation, destined to be a future classic. Designed by Jonathan Ball, Acre is a tribute to the designer’s great grandfather, Tex Acre, who created road signage for American diners and motels in the 1950s. 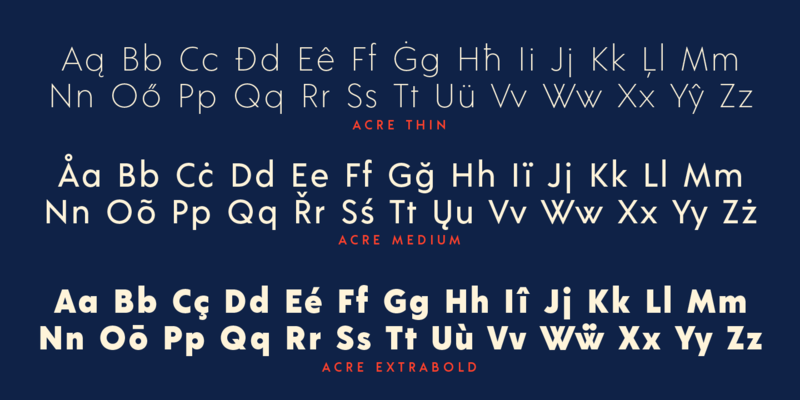 Characterized by the perky, rounded type style that is typical of midcentury design, Acre manages to bring the retro styling bang-up-to-date. It’s a truly versatile font that looks good set to any size. Use it to give an optimistic mood to any designs in need of a lift. On the Hunt For More Great Fonts? The ten classic fonts above are handy workhorses to always have to hand. Their versatility and timeless good looks make them suitable for almost any design project. If, however, you’re looking for something a little different, make sure to check out these free calligraphy fonts which are great for branding projects, or discover these ultra-modern fonts to give your designs some contemporary edge. Top image by Tanya Chursina via Behance.